Last year, we had a nameless recipient for EGP Award #28. Hello Oliver – AKA Coolest Iron-Kid EVER! I had set the task for you, my magnificient minions, to find this kid and announce to the world how awesome his parents are. In the comments, we have heard from Audrey, Oliver’s mother and the designer of this brilliant costume. She’s a Studio Arts Major who uses her son as inspiration and laughs. That’s a beauty right there. I think she may have graduated by now, and is now loose on the world – conquering the masses with her awesome creativity. There’s the Minister of Design for my new world order. But don’t think this is a one-off. Oh no. Audrey is VERY deserving of her EGP Award. And honestly – I reckon she nailed it for 2013. She loves creating things for her spawnling, and he loves being part of the fun. I love the interwebs. We found Oliver. And his awesome Evil Genius Mum Audrey. If you want to read Audrey’s comments and some of the history her designs, go here. 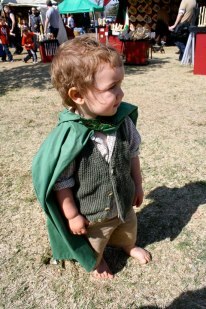 This entry was posted in Evil Genius Parent Award and tagged cosplay. Bookmark the permalink.